As you know, I am Willie. She calls me wild Willie. I think I should be called William the Magnificent. She sometimes does not get my drift. 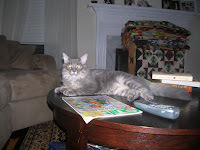 Here I am-forced to recline on a hard table, while behind me there is a PILE of soft quilts just waiting for some gray fur. I thought about giving a call to Morhp, Gomez or Edgar Poe to get their take on what I should do next, since they have their person trained. I am not doing as well! Yesterday I took the quilt over to Snugglebutt's house. I also took the crib bumpers and the diaper stacker. The quilt looks really cute in the nursery and no I did not take a picture of it. We could not try the bumpers on because the crib was full of already laundered and waiting to be put away baby clothes. Next weekend, Kris and I are going to work on the curtains. She has decided to use some of the fabric for a border on store bought curtains and has also decided not to have a valance. I did not do very much of anything over the weekend. I want to make the border for the one quilt project I did at camp. I also need to make a trip on Saturday probably over to Tiny Stitches to check out fabric for the other small project I did at camp. And now I am going to do more of nothing!! It was really nice to see the sun. It has warmed up again. I decided to try my usual route to work this afternoon and it was open!! I could see that the water had risen quite high but it has receded. The roads are stained with mud. Don't know why but am really tired. I ended up on the couch this evening for a short nap...well not so short. Last evening I cut the 2 blocks that I had not completed on the weekend and I intended to work on one this evening. Well tomorrow is another day. Hopefully things are returning to "normal" and routine again. Looking forward to boring! This morning I had to turn around twice and it took me twice as long to get to work. This afternoon was worse-everything is flooded. I am so glad to be home this evening. I needed to stop on the way home for a few things but that just didn't happen. I will survive! I finished sewing on the binding last evening on my version of Bonnie Hunter's quilt Double Delight. 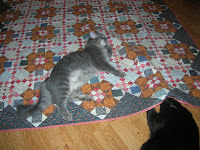 Willie and Spooky are the quality control on this quilt. Henry gave it his "Paw of Approval" as well. He was sleeping on it as I was sewing on the binding! Vicki did the quilting on this one and brought it with her to camp. I had the binding on it before she came down for breakfast! I do love this quilt. I love the cheddar blocks mixed with the pinks. These are not my usual colors. Now it is back to work and back to finishing up sewing the binding on Snugglebutt's quilt. 'FaFaLand' is about an hour an fifteen minutes from my home. It is located south of Covington, Ga in rural farmland-many cows, goats, horses, etc. This morning when I was leaving I saw a bunch of wild turkey(at least that is what I think they were)! I arrived on thrs morning and set up my station-pretty much s zip code!-all the necessities needed for heavy duty sewing. Sharon and Shannon are the leaders of this happy band of quilters. They plan all year for this weekend. And I look forward to this weekend all year. They do an excellent job of mixing instruction, games and giveaways. Cindi, Louise and I have been to all 7 of these great weekends. This year there were 16 quilters present-gals we see but once a year. Several "Thimbles" were there this weekend as well. 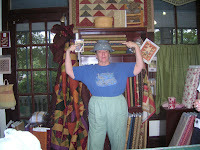 Field trips to local quilt shops-Sweet Home, Patrick's in Covington and the shop in Jackson. I needed some stuff at Sweet Home and Patrick's. Bought a quilt top kit there for one of the little girls-not sure which one will get it yet. Saturday night we had an auction to "Send a kid to camp". I think the auction brought in over $700-not bad for 18 people! Not too much sleep-sewing until the wee hours of the morning and then trying to fall asleep with achy bodies. Lots of tylenol! Quilts seen on the bed tour were spectacular-lots of last year's project returned all quilted! I really need a nap now! On a field trip to Sweet Home..just to check out any new goodies that were a necessity, I discovered that Bad Melisa has some protection from those microwaves coming from the Moda Man. I tried one on as you can see...it didn't help-too many holes in it! I am working on the quilt that is to my right shoulder. It has such wonderful rich colors in it. I am going to LOVE this one when it is done. 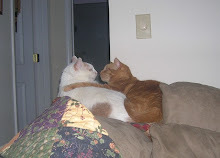 My boys were happy to see me and now that I have cleaned up their severl messes and also took care of their litter box, we are going to sit on the couch and have a little scratch the head time. This was Willie's first time alone. I wonder what he thought? No Redemption for Bad Melisa..
One of my friends made a call out to the Temptress requesting that she hold a certain packet of fabrics for her. Melsia was VERY accommodating. Now said friend thought that her name should be Glenda the Good Witch. AND THEN, she went out to pick up the fabric and was sucked in to the Sweet Home vortex. I guess she didn't believe me but she does now!! And once again...the evil temptress and the Moda Man have struck!! Now I have to go unload my sewing room and load the care for camp. I have some stuff in the car already but not nearly all the necessities. I haven't even thought about the clothing attire yet but that is not the important stuff. I am so looking forward to the next couple of days! Funny thing...Sweet Home is on the way to camp. I guess I need to stop there in the morning just in case there is something that I have to have. Had to make a stop on the way home from work. Sewing machine light not working. I tried a replacement but it did not work. But the new one did! I have been working without a light for about a week. It was quite the challenge! I put the walking foot attachment on and got started on the quilting. I had pinned AND basted the quilt but I was really worried about how it would quilt. Actually it was not bad. And now it is done. All I need to do is make the binding and sew it on. I am ahead of schedule! Also finished making this month's BOM from Fat Quarter. I have had the best weekend so far. Two sessions of Thimbles sewing! Last evening I worked on the quilt top that is millions of flying geese from the jelly roll book. 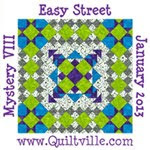 Today at Thimbles I worked on last month's quilt using the glace material from (moda) heehee. It has all those bias edges and it is not an easy puppy to do. THEN I came home and started on Snugglebutt's baby quilt. I have the top done!!!!wootwoot! I have to get some batting tomorrow and then I can layer it up. It will be quite the challenge to quilt this as the material is sooo gauzy. I may need to resort to the bottle to finish it. But now I am going to reward myself...I am going out and get me some Brewster's ice cream!!! Some time soon I will have to think about creating the tin foil helmet to prevent the Moda signals from getting through!! Could it be that Moda has another marketing concept? I was on the phone this morning bright and early, speaking with the Evil Temptress herself. Did I mention how beautimous these fabrics are?? I am thinking about doing another Honeyberries with the Wiscasett. Add another to do project to the list!! So many ideas, so little time!! AND next week is quilt camp...wootwoot!!! Okay, I guess it is really not her fault, but I think she need to take the lame anyway! 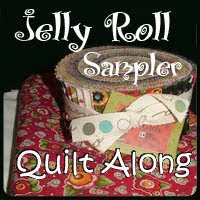 she blogged about the new Sampler magazine and that copies were going fast. Bright and early I headed out to Sweet Home to get my copy. Gretchen was already there. She needed thread!!! Like there is no thread closer! Kind of like when Sue was in college and there were no stamps in Oswego. (Funny we found that Oswego, NY actually does have a post office!! Over in the corner of the Moda room is a sample of a most beautiful quilt. Yummy Fall colors....be still my heart. It is too beautiful. I NEED TO MAKE THIS QUILT. She has it all kitted up. All I need do is take it to the register. She tells me if I get the backing today, it will be 20% off. Of course I'll take tha backing, thank you very much! I had my gift certificate from Sue friend Judy for babysitting (that will help a little). AND I had some receipt's from past damage. I had enough receipts for 5 yards of fabric with leftovers for next time. BAD BAD MELISA, I say anyway. 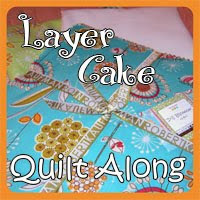 Now I am going to make binding and fondle my new fabric for the yummy quilt. I guess this will be my "Melisa made me do it" quilt! I am SO glad it is Friday and I don't have to think about work for 2 whole days!!!! I just want to take off all of the work clothes, put on comfie ones and do NOTHING. But that is not productive. I plan on doing some sewing. I am looking at piles of fat quarters that I recently acquired with no project in mind. Also that yummy quilt in Quiltmaker is telling me I need to make it!! Not to mention beginning to pull my stuff together for quilt camp. Now less than 2 weeks away!!!!! Mr. toilet paper is for me to shred is at it again. Last night I was lying on the couch and I could hear someone making noise. I was too lazy to get up off the couch. When I got ready to go to bed, I checked the bathroom and found that Willie had had a great time. Why does the boy like toilet paper? He brings all of his toys to bed so I guess I am glad that he has not figured out how to get the toilet paper there too!